(CNS): The independent member for North Side has called on the government to change the constitution and put an end to top public sector life-long appointments provided for under the 2009 Cayman Consitution. Ezzard Miller said that those holding top jobs within specialist public sector bodies, such as the complaints commissioner, the auditor general and the director of public prosecutions, should not have those jobs for life and should serve for three years only, with a possibility of renewal for two more years if they do a good job. However, five years should be the maximum amount of time that anyone should serve, he said, because at present there is no way to remove people who fail to live up to their high office. Miller is asking for a select committee of parliament to examine the constitutionally established and protected posts and review the terms of office to ensure no one can hold any post such as the attorney general’s job for life. While some are five year terms he said the people holding the posts are still able to re-apply for another five years and he said that he believes it is too long for the same person to hold these important independent positions because no one is able to hold them to account. The MLA said that this may require a referendum as the constitution calls for all but minor changes to it be put to the people but either way it was time to make the change and put an end to people holding high office eternally without anyway of removing them. He pointed out that for those holding senior life-time contracts, there is no evaluation process and no one is assessing whether or not they are doing a good job. “There is no mechanism for review or evaluation in a number of senior and very important positions and that needs to be addressed,” Miller said. Hoping to get the backing of parliament, Miller is bringing a private members motion to the Legislative Assembly when it meets next week to begin the process of examining the constitution and establishing whether the changes can be made by the Legislative Assembly or whether it needs to be put to the people. He said that if a referendum was required, it would be cheaper to do it at the same time as the 2017 election . But he said the sooner a committee was established to address the issues the better. (CNS): In celebration of its 30th anniversary, UWC Cayman Islands is collaborating with Friends of Film (FoF) and UNLIKE Festivals to host UNLIKE Cayman this month. UNLIKE is a touring arts and culture festival that gives artists an opportunity to showcase their work while bridging different cultures through the arts. By providing music, art and film in a relaxed environment and without entry fees, it also breaks the barriers that often surround these media and supports talented young artists. Through the efforts of committed volunteers, UNLIKE has already featured in Yogyakarta, Indonesia; Oslo, Norway; and Helsinki, Finland in its first year. UNLIKE is partnering with FoF, UWC Cayman Islands, and a number of other volunteers from the local arts scene to produce the festival. FoF is a diverse group of working film professionals dedicated to motion picture production in the Cayman Islands. UWC Cayman Islands is a national committee of the global United World Colleges movement, whose mission is to use education as a force to unite people, nations and cultures for peace and a sustainablefuture. The event will take place the weekend of 26-28 September. All proceeds will go toward the charitable foundation’s scholarship programme that ensures a need-blind selection process based entirely on merit for all Caymanian UWC scholars. “FoF is delighted to be part of UNLIKE Cayman. It’s rewarding to be able to help an organisation like UWC Cayman Islands that gives students a transformational educational experience in which they find ways to achieve a more peaceful and sustainable future and we are thrilled to be partnering also with the inspiring UNLIKE Festival,” said Colleen Dahlstrom, co-founder of FoF. UNLIKE Cayman will give many different types of local artists with varying levels of experience an opportunity to showcase their hard work and talent, while also giving the community a chance to come together and enjoy themselves. The main festival will take place all day Saturday, 27th September at Camana Bay, with an opening Cocktail Reception at the National Gallery of the Cayman Islands on Friday 26th September and a Closing Brunch on Sunday 28th September at Royal Palms. Saturday’s festival will be completely free for all to attend and tickets for other events will go on sale in the coming weeks. “Our focus now is on collaborating to make the festival in September one to remember, by connecting likeminded people and experiencing everything the cultural community in Cayman has to offer,” Dahlstrom emphasised. All filmmakers, visual artists, artisans, craftspersons, musicians, dancers, authors, poets and other performers and artists are welcome to participate in the festival. 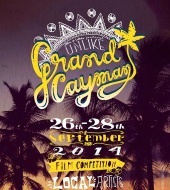 For more information about participation, tickets or sponsorship opportunities, please contact UNLIKECayman@gmail.com. The Platinum Sponsor of UNLIKE Cayman is Dart Enterprises Limited. Gold Sponsors include Greenlight Re, the Ministry of Health, Sports, Youth & Culture, Morval Bank & Trust and Regal Cinemas; Silver Sponsors include Awesome Productions, Grant Thornton, Touch of Thai, Kensington Management Group, Pcreative, Hopscotch Productions, Lion’s Productions and CML TV; and Bronze Sponsors include Strategic Risk Solutions, Global Captive Management, CUC, Ogier, Island Heritage, BCQS, Cayman Spirits Company and the National Gallery of the Cayman Islands.